Some big surprises coloured the first round of the tournament as seeded shuttlers were sent packing. Several title contenders were on the brink of losing to their lower ranked opponents. The stunning defeats of the day were defending champion and one of strong favourites, Lin Dan, and Men’s doubles second seed, Ahsan/Setiawan. In Men’s Singles, China top seed Chen Long dropped 1 game and was pushed into the limit by Indian qualifier Gurusaidutt while in contrast, third seed Jorgensen was pretty smooth to clinch last sixteen spot. Srikanth saved four match point to avoid an early exit against Vittinghus with similar case with Wang ZM against Kashyap. Former Thai #1 Boonsak Ponsana stunned Son Wan Ho who show a string of poor results lately. There are three intriguing matches: first seed Chen Long will face the evergreen Hu Yun who defeated him twice in their last two meetings – can the world champion take revenge tomorrow? Secondly, Indian leading men’s singles player Srikanth against Tian HW who eliminated the world #4 in Malaysia last April and third, Danish young star Axelsen, who created a stunning headline by beating Lin Dan, will take on China promising talent Xue Song. In ladies singles, Tai TY and Intanon suffered early losing while Wang YH was stretched into a tiring three games against Sindhu with another tricky rival is waiting in the form of Sayaka Takahashi. 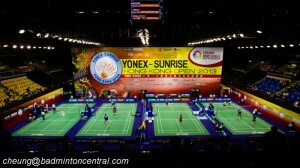 Wang SX v Busanan and Nehwal v Sun Yu possibly will be close ties tomorrow. Carolina Marin and Li Xuerui are expected sail through to the last eight. Two Korean men’s doubles, top-seed Lee YD/Yoo YS and reigning world champion Ko SH/Shin BC made perfect start here while their compatriot 8th seed Kim GJ/Kim SR succumbed to Hashimoto/Hirata. Two interesting duels in this department, Lee SM/Tsai CH will meet Koo KK/Tan BH also Endo/Hayakawa v MAS #1 Goh VS/Tan WK. There were minor upsets in women’s doubles as the 7th & 8th seed have been ousted. Otherwise, all favourites are going to the script. Two highlight matches are Maheswari/Polii v Gutta/Ponnapa and Chang YN/Jung KE v Ma J/Tang YT. The top three seeds in mixed doubles all displayed shaky performance at the round 32 matches. Now, two Chinese combinations Xu/Ma and Lu/Huang will take on Korean scratch pair Shin BC/Chae YJ and Choi SG/Eom HW respectively. Jordan/Susanto once again will face their nemesis Lee CH/Chau HW.